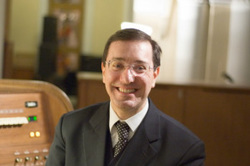 Gianluca Libertucci is one of Italy's foremost organists, with high profile positions such as the organist of the Vicariate of the Vatican City in St. Peter's Basilica, Pontifical Swiss Guard, General Audience of the Holy Father, and of the Church of Santa Maria in Trastevere Orto, Rome. Libertucci is also 'Professor of "organ and organ composition" at the Conservatory of Music "Benedetto Marcello" of Venice. He holds a diploma in Organ and Composition at the Conservatory of Music "Santa Cecilia" in Rome under the leadership of Louis Celeghin. He followed courses in organ held by Michael Radulescu, Christopher Stembridge (at the Music Academy Chigi of Siena) and Ludger Lohmann. He has an intense concert activity as soloist in the context of the major national and international organ festivals: Albania, Austria, Belgium, Bulgaria, Denmark, Estonia, Russia, Finland, France, Iceland, Germany, England (Gibraltar), Italy, Latvia, Luxembourg, Malta, Montenegro, Poland, Portugal, Czech Republic, Ukraine, Slovakia, Spain, Sweden, Switzerland, Hungary, Vatican City, Japan and the United States of America. In 2007 and 2013, respectively, has performed with the Orchestra del Maggio Musicale Fiorentino and the Orchestra del Teatro dell'Opera di Roma "Concerto in G minor" for organ, string orchestra and timpani by Francis Poulenc. Gianluca designed the new great organ for the auditorium of the Istituto Musicale "Vincenzo Bellini" of Catania. He was a member and coordinator of the technical and artistic committee for the restoration of prestigious organ keyboards and three-to five consoles built in the eighteenth century by Donato Del Piano for the Benedictine Abbey of San Nicolò l'Arena in Catania. He directed the restoration of all the organs of the Basilica of St. Peter. In December 2002 he participated in the inaugural concert of the new organ of the Sistine Chapel and in May 2007 he held the inaugural concert of the new organ in the Chapel of the Governorate of Vatican City in the presence of SS Benedict XVI. In 2008 he was chairman of the Committee on International Organ Competition "Soli Deo Gloria" held at the Catholic Cathedral in Moscow. He recorded the CD "Coronas annum benignitate" (published by the Vatican Library) and "Deus caritas est" (Multimedia San Paolo) containing all the compositions for organ by Mons. Giuseppe Liberto, master emeritus of the choir of the Cappella Musicale Pontificia "Sistina". Libertucci has worked as an organist with the Teatro Massimo Vincenzo Bellini in Catania, with the Accademia Nazionale di Santa Cecilia and the Teatro dell'Opera di Roma.